Hijacked By Twins: Foodieseeker Friday - All About the Food and Drink! Foodieseeker Friday - All About the Food and Drink! Being the Foodieseeker Blogger for Carnival Cruise has meant that I have spent a lot of time looking at what food Vista will have to offer. I have already told you about the places to eat on Vista but today I thought that I would tell you about what meals I am looking forward to tasting! 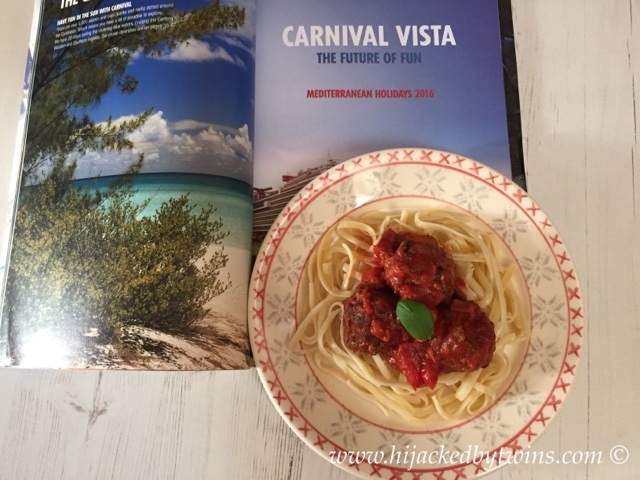 We now have our tables booked to visit three of Carnival Vista's speciality restaurants Cucina del Capitano, Ji Ji Asian Kitchen and Fahrenheit 555 Steakhouse. You may remember that in April I told you about Cucina del Capitano and made my own version of Nonna's Linguine and Meatballs so this is a meal that I will definitely be ordering when we visit. As I am terrible at ordering when in a restaurant I have decided that a bit of forward planning is needed. I simply cannot make my mind up when faced with so many delicious meals to choose from. I am known for taking a long time to decided and for changing my mind! Appetiser - Antipasti - This is a favourite dish of ours, we love to start a meal with breads and olives so this will be a must have! Entrees - Nonna's Linguine and Meatballs - I cannot wait to try this dish, especially after I cooked how I imagined it to taste! Dessert - Magic Tiramisu - In my mind tiramisu is the ultimate Italian dessert and Vista's Cucina del Capitano's tiramisu sounds amazing! Appetiser - Jiaozi - This is a dish of shrimp dumplings, pea shoots, radish and green apple salad. The Chinese believe that this dish brings good luck and prosperity! Entrees - Sweet and Sour Fragrant Shrimp - I love a good sweet and sour dish so, following on from the shrimp starter, I will be having crispy shrimp, tomatoes, pineapple, peppers and scallions with plum sweet and sour sauce with Himalayan Basmati rice. Dessert - Rose Creme Brulee - This creme brulee is served with a ginger cream. Appetiser - Beef Carpaccio - It took me quite a while to decided which starter to go for, they all sound so good. But in the end I decided to go for a dish which I have not had before but have wanted to try. Beef Carpaccio is raw beef tenderloin sliced thinly. It is served with Parmesan and marinated Mache lettuce. Entrees - Broiled Fillet Mignon - Fillet Mignon is know to be the leanest, most tender cut of meat and I am sure that Carnival Vista will not disappoint! Dessert - Cheesecake with Hazelnut Biscuit - Again, this took a while to decide on! I did change my mind a number of times, this is why I try to decide before going! All of the desserts sound so good. I am hoping that the hubby will get a different so that I can have a taste of his! With regard to drinks, there are a few drinks included in the holiday package. They are coffee, hot tea, hot chocolate, lemonade and unsweetened iced tea. But all other drinks include an additional fee. However, to help, Carnival offer drinks packages. We have decided to go for the "Bottomless Bubbles" package. This will enable us to all have unlimited soda and juice. This will make it easier for us all to have drinks without worrying about charges throughout the day. Bottomless Bubbles allows us to have Coca-Cola, Diet Coke, Coca-Cola Zero, Coca-Cola Caffeine Free, Diet Coke Caffeine Free, Dr Pepper, Orange Soda, Sprite, Diet Sprite, Mr Pibb, Barqs Root Beer, Ginger Ale, Tonic Water, Club Soda, Orange Juice, Cranberry Juice, Tomato Juice, Pineapple Juice, Grapefruit Juice and Fruit Juice Punch. As it will be lovely and hot we will be wanting plenty of cold drinks and priced at just $6 (£4.55) per day for adults and $4.50 (£3.41) for children, it is going to work out a lot cheaper to buy the package. If you want to drink alcohol while on Vista you can either pay for the drinks as you have them using your Sail and Sign account (no cash is accepted on board, all charges go on an account which is then paid for at the end) or there is a package for alcoholic drinks. The Cheers package offer costs $54.95 (£41.65) once on board and this allows you to have up to 15 alcoholic drinks per day and also offers the same drinks as the Bottomless Bubbles. But the Cheers package also allows you to have unlimited speciality coffees and teas, zero proof frozen cocktails, milkshakes, Rockstar energy drinks, Powerade, vitamin water, coconut water, Honest Tea and bottled water. I have only told you about the speciality restaurants today but there are so many other places to eat which are included in the package. So you can be sure of plenty of foodie pictures alongside pictures of Vista and the sea! There really is so much to offer on Carnival Vista and I cannot wait to show you it all! Disclosure: I am Carnival Cruises Foodieseeker Blogger. I am the same in restaurants, take ages to make up my mind. The dishes you have chosen sound lovely as do the places you are going to be eating. I take forever to decide in restaurants, as I just want to eat everything haha.